They are so tiny that you would be considered unique if you'd ever seen one - a hummingbird nest that is. Made from scraps of foliage and spider webs, the nest is quite comfortable during the mother's laying in. Amazingly enough, the tiny nest that measures 1 ½ inches wide expands as the baby birds grow. In preparation for the painting, Dempsey was lucky enough to be able to study an actual hummingbird nest loaned to him by a customer. You can feel Dempsey's love for his subject in the careful attention to every exquisite detail from the finely drawn bark on the tree limb to the perfectly drawn mother bird and her nest. Hummingbirds in flight you see, but it is very rare that you see a painting of a hummingbird nesting. 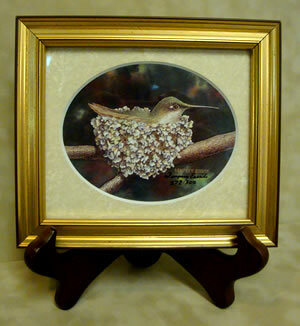 "Hummer 'a Nesting" is a Thumbnail size limited edition print and is the latest item in the Dempsey Essick Hummer-ville Gift Line.